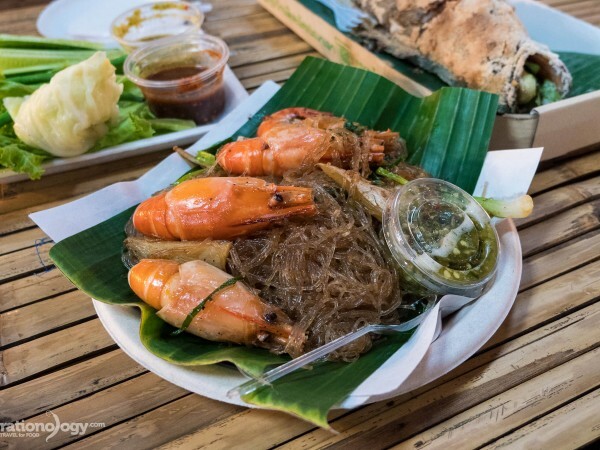 Along with eating, one of my favorite activities to do when I travel is visit local fresh markets, and I think fresh seafood fish markets are some of the most interesting. But, in the United States, it’s not quite as easy to visit a local fresh market, as it is to do so in a place like Krabi, Thailand, or Kota Kinabalu, Malaysia. So when my Uncle mentioned heading over to the Honolulu fish auction one morning, I was excited. 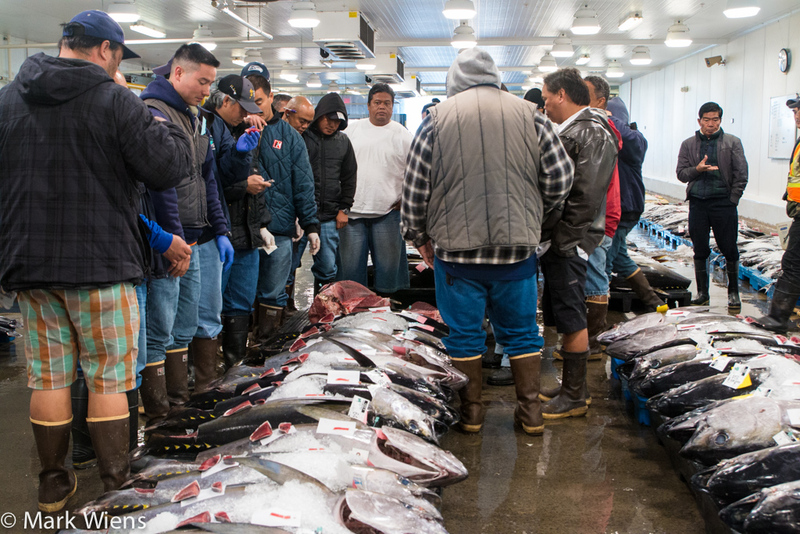 At the Honolulu fish auction you can see a number of different fish, but the majority are yellowfin tuna – a common fish used in sashimi and sushi, and poke in Hawaii. 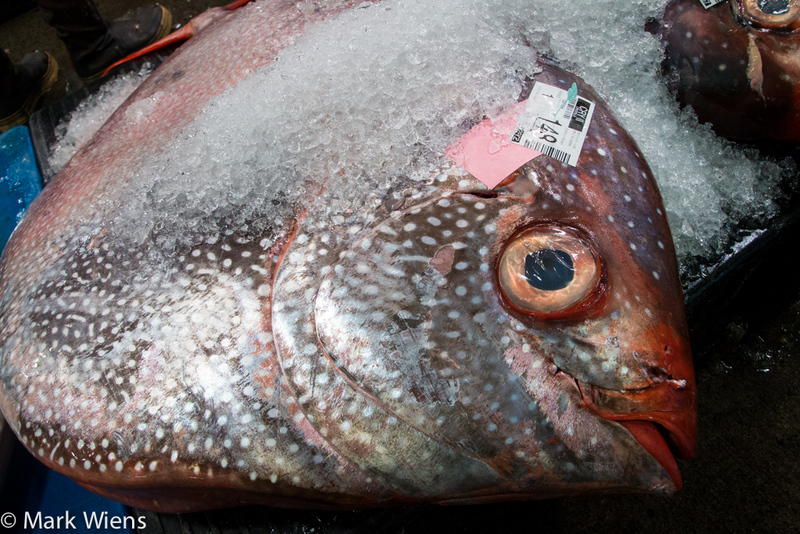 There were also a few palettes of opah fish, or moonfish, which one of the exporters at the auction told me was the fish with the highest amount of omega 3 oils per bite. I wanted to eat some of that right then and there! 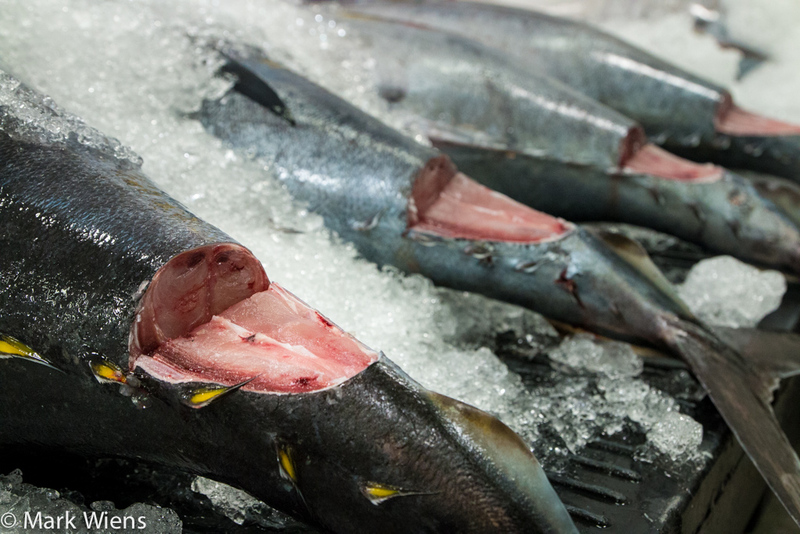 Mahi mahi, also known as a dolphin fish, is a Hawaiian favorite too. 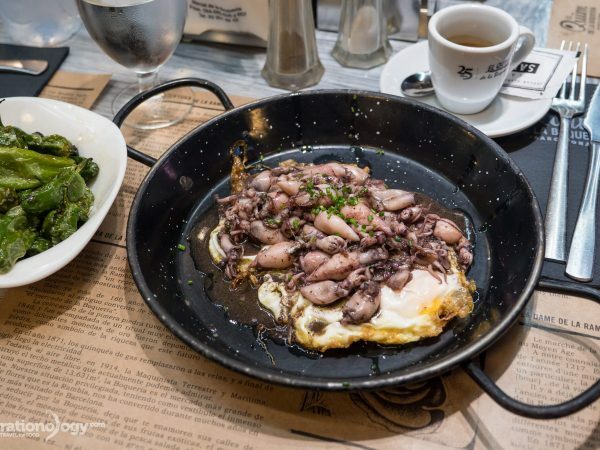 The fish is usually cut into fillets, and either grilled as is, or breaded and deep fried. Mahi mahi is a common fish included on local Hawaiian plate lunches, and it’s mild in flavor, with excellent texture. There were also some other giant fish and smaller fish at the auction as well, but those three seemed to be the top fish everyone at the auction were pursuing. Ok, let’s get back to the actual auction part of the fish market. 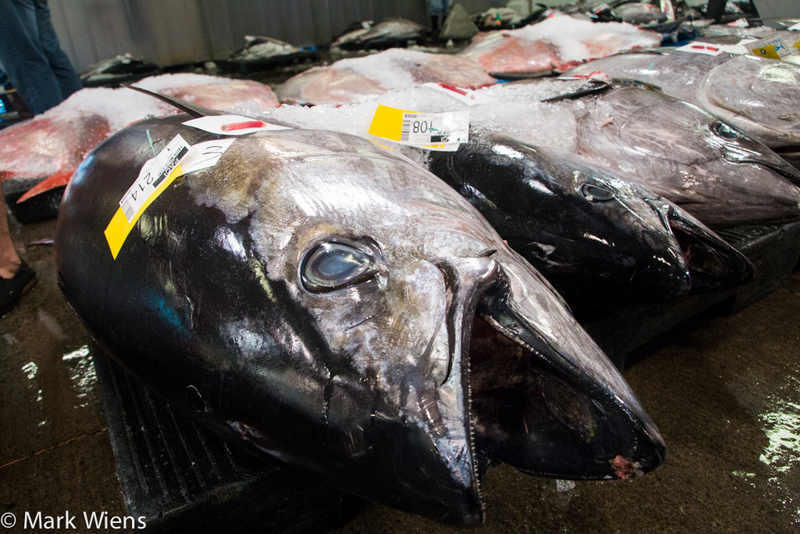 The Honolulu fish auction is the only live fresh tuna auction in the United States. Starting early in the morning, 1 am to be exact says the official website, boats dock at Pier 38 in Honolulu, and start to unload their catch next to the auction warehouse. 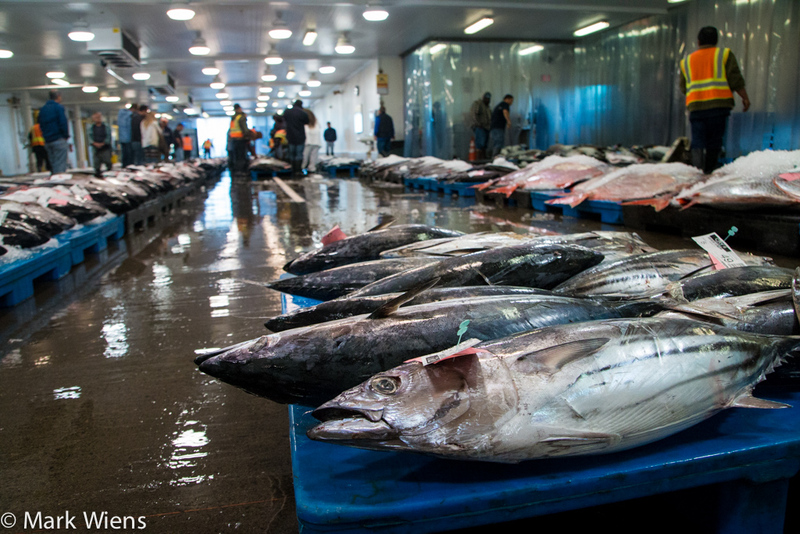 Directly from the boat, the fish are placed on palettes and immediately rolled into the refrigerated auction warehouse. When I was in Tokyo (video), I wanted to go to the tuna auction at the Tsukiji fish market, but they only allow 120 tourists into the auction each morning at 5 am, and you have to be in line by 4 am, meaning you have to take a very expensive taxi ride to get there – so I didn’t end up making it to the auction part of the market. On the contrary, the Honolulu fish auction is open to the public, not only to come and see the auction, but also to buy fish from the auction. 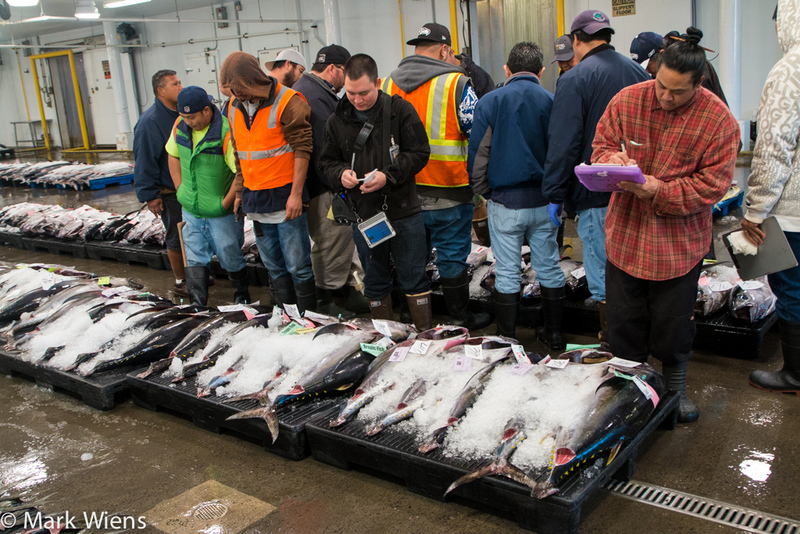 All that to say, it’s much easier to get into the Honolulu fish auction than the Tokyo auction. We arrived right at around 7 am. 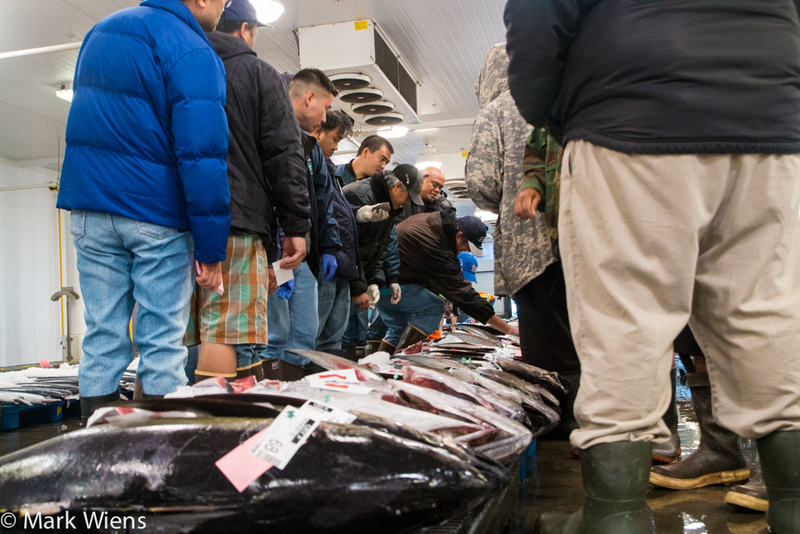 The tuna auctions were taking place, and a group of about 15 or 20 men were quickly going from fish to fish, spending just a few moments at each tuna until the auctioneer sold it. It moved quickly. Many of the people participating in the auction were seafood distributors, sort of the middle men between restaurants and stores and the fishermen. 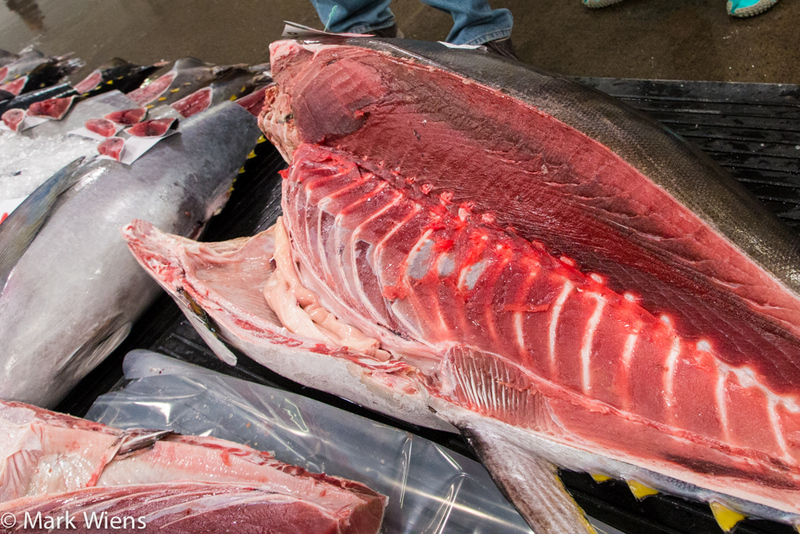 Like I already mentioned, ahi, or yellowfin tuna, dominated the Honolulu fish market. 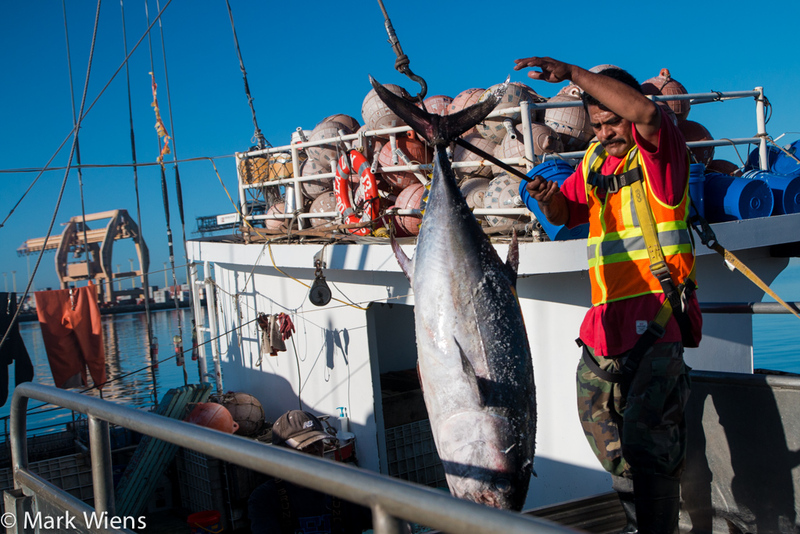 Much of the ahi was either purchased to consume locally in Hawaii, or shipped immediately to the mainland of the US, mostly to Japanese restaurants serving fresh sashimi. The auction moved quickly, down the rows of the fish. However, unlike in Tokyo where you’ve got to watch out that you don’t get hit by a speeding seafood forklift truck, the Honolulu fish auction is nice and calm, with no motor vehicles, and only hand palette jacks. 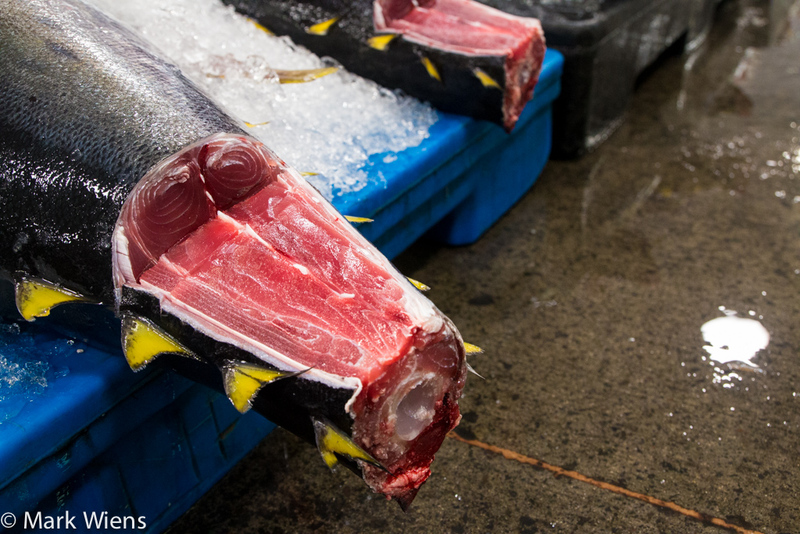 On most of the ahi tunas, a piece of the tail was cut out in order to judge the quality of the meat. 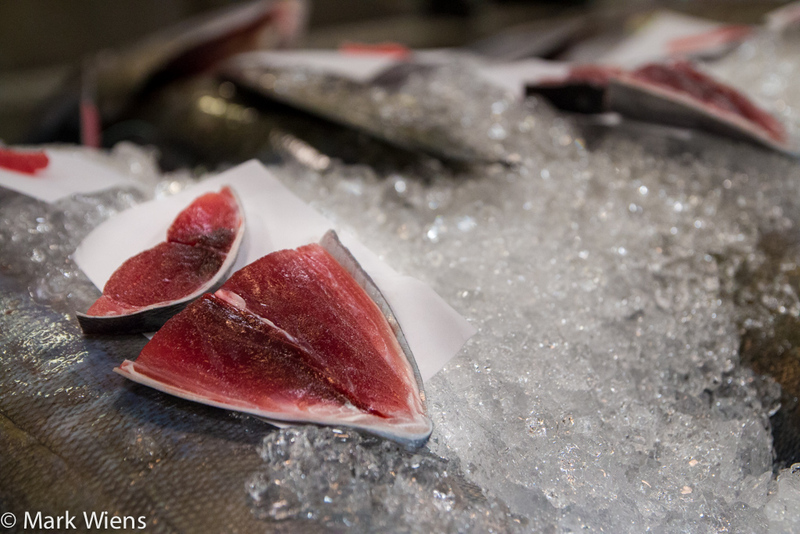 I don’t begin to know too much about grading tuna, though it is something I would love to learn more about (considering my love affair with eating sashimi and poke), but I think it’s often the darker maroon colored tuna that is a higher grade from the lighter flesh, but it also has to do with texture. 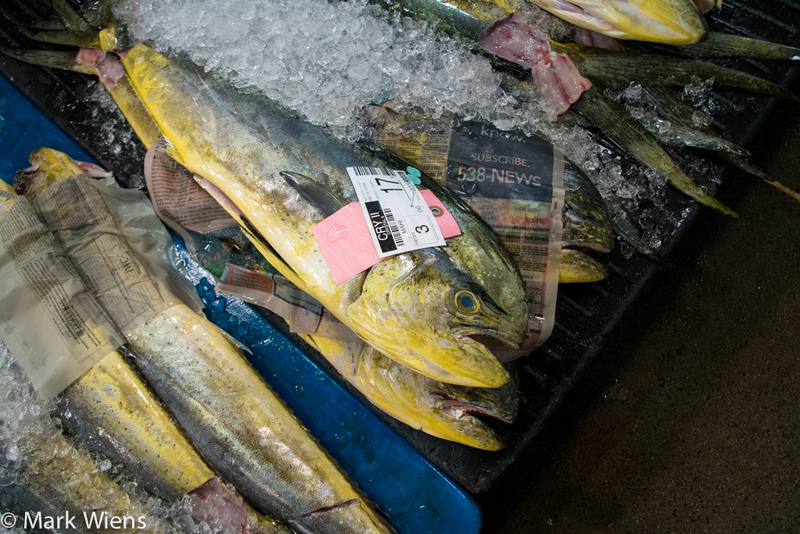 After the fish were sold and done, they would get priced and marked as sold by a crew of staff. After spending about an hour at the auction, I started to get extremely hungry for sashimi. I wanted to pick up one of the samples right then and there, pour on a bit of shoyu and wasabi and just let it melt on my tongue… I resisted the temptation! I wanted some of that sashimi! 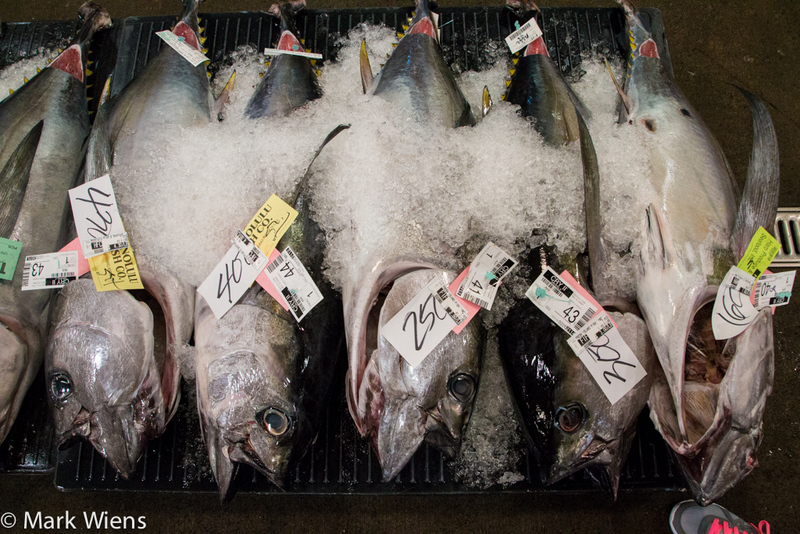 The Honolulu fish auction is a great place to visit when you’re in Honolulu. 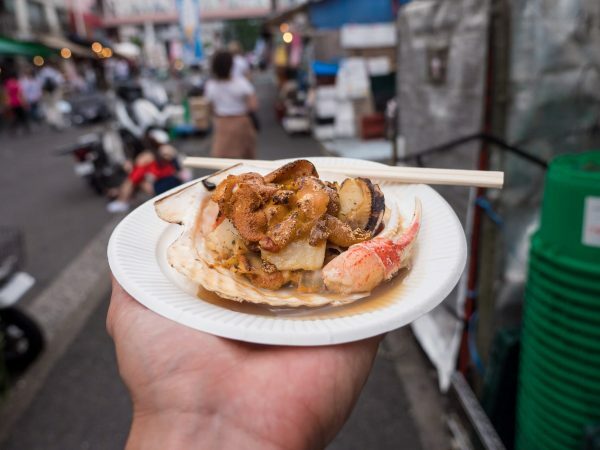 Very few visitors actually take advantage of this fantastic seafood market, but if you enjoy fish and eating sushi, it’s really worth adding to your morning itinerary. Address: Located at Pier 38. Official website here. Do you like fish markets? Great post! 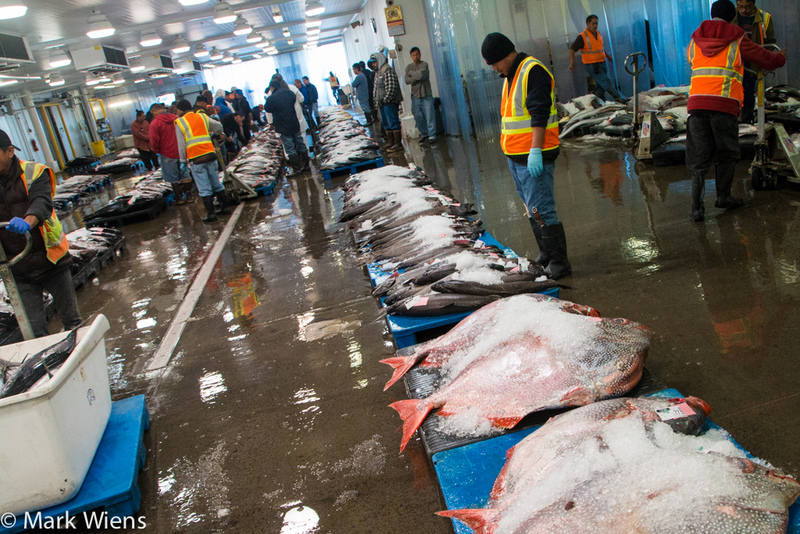 I’m heading to Honolulu this October and would love to see the fish auction. My travel partner though isn’t so keen on the 5:30am start time. Do you have a rough estimate as to the latest we could get there and still see some action? Hey Ellie, great to hear from you, glad you’ll be going to Honolulu. I think you could go around 7 – 8 am and be able to still see some action. Enjoy! Sounds like a really fascinating place … not exactly what you think of when you hear the name Hawaii, but us foodies are a different breed! Hey Meghan, yah it’s a really cool to place to visit, I really enjoyed it! I, m like you mark , love the fish markets ! Went to the negombo fish market in sri lanka , although smaller it was a hive of activity ! Buying and selling , just fascinating to watch ! Hey Steve, glad you love fish markets too. Oh, yes I visited Negombo fish market too, was very cool! Sri Lanka is still one of the most memorable places I’ve visited! Wow..another great article. Whenever I visited a fishmarket, especially the ones at a dock, there would always be some places there to eat some fish aswell. How was that there? Keep up the great reporting Mark! Hey Francis, there are a couple of restaurants, but most of them are a little upscale. I did go to one a few years back located at the pier called Nico’s Pier 38 – was pretty good! But not so many options like there would be next to a fish market in most of Asia.